Senate Democrats are doing the Stanky Legg Two-step in order to dance away from confirming a nominee to the U.S. Supreme Court who is a federal judge provably as devoted to following the U.S. Constitution and the body of federal law as any nominee in many years. Judge Neil Gorsuch, whose record on the bench of the 10th Circuit Court of Appeals is as nearly perfect as one can hope to achieve, is precisely the type of judge the Founders had in mind when they wrote the Constitution, a man in the mold of the late Antonin Scalia, whose vacancy he has been nominated to fill. Testifying before the Senate Judiciary Committee, Gorsuch said his law clerks had compiled information about his ten years on the bench of the 10th Circuit, which covers about 20 percent of the U.S. He has participated in more than 2,700 appeals, 97 percent of those cases were decided unanimously, and he was in the majority 99 percent of the time. How much more mainstream can one be? His record clearly identifies him as a mainstream appellate judge, as has the American Bar Association, not an ideologue, or someone who plays favorites. Nevertheless, an exercise designed for confirming a qualified person to sit on the nation’s highest court has devolved into a political war. U.S. law is a system of rules that govern behavior. Rules and laws must be followed and not following laws has penalties. In the U.S. laws are not static; they can be amended or repealed, but they must be amended or repealed through a specific process. However, some people – primarily liberal Americans – believe that this process may be circumvented by the rulings of activist judges when laws get in the way of their inclinations. Gorsuch’s adherence to the law is the primary objection to his nomination, although some say it is also because the Republican majority in the Senate refused to take up the nomination of Judge Merrick Garland for the seat Gorsuch is now nominated for. This, too, points to a Democrat anomaly. A principle relating to this situation arose in the U.S. Senate in 1992 when then-Sen. Joseph Biden, D-Del., who was chair of the Judiciary Committee, said on the Senate floor that filling Supreme Court vacancies “that would occur in the full throes of an election year,” must be held to a different standard. Citing “a majority of his predecessors,” Biden said that the president, George H.W. Bush, should delay naming a replacement, which would de-politicize the nomination, at least for a while. In March of last year, “in the full throes of an election year,” President Barack Obama ignored the advice that Biden, who was then his Vice President, had offered on the matter years before and nominated Judge Garland. The Republican Senate Majority Leader, Mitch McConnell, R-Ky., however, liked Biden’s theory, and would not schedule hearings for Garland. Democrats want judges that decide legal issues on whether their decisions fit the passions of the moment or have their preferred impact on the people, and therefore disapprove of the necessity to appoint judges that follow the Constitution and the law. Minority Leader Sen. Charles Schumer, D-N.Y., is upset with Republicans over the Merrick Garland issue, and will therefore not vote to confirm the highly qualified and squeaky-clean Gorsuch. He spent 20 minutes on the Senate floor urging his fellow Democrats to oppose Trump’s nominee. 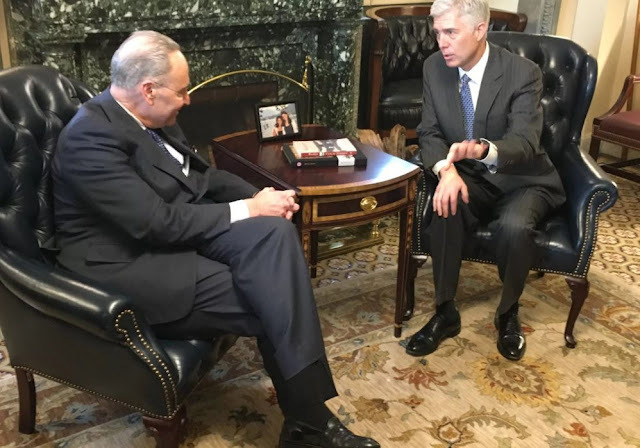 Gorsuch, he said, “was unable to convince me he would be a mainstream justice who could rule free from the biases of politics and ideology.” And he said that Gorsuch “is someone who almost instinctively favors the powerful over the weak, corporations over Americans,” Schumer said. “He declined to answer question after question with any substance,” he said, referring to Gorsuch’s refusal to express his political beliefs or to prejudge issues that may come before the Court. ** Sen. Kamala Harris, D-Cal. : "As U.S. senators, we have an obligation to also examine a nominee's legal approach and ask whether he or she considers the impact of those decisions on our society and the daily lives of our people." ** "I cannot trust that President Trump is acting in the best interest of our country or our democracy and that I cannot support moving forward with his choice for the court," said Sen. Patty Murray, D-Wash.
** Virginia Democrat and former vice presidential candidate Sen. Tim Kaine explained that, “After meeting with Judge Gorsuch and reviewing his testimony and past decisions, I’ve observed that he has repeatedly taken an activist approach to cases involving a woman’s right to make her own decisions about her health.” Kaine clearly does not understand judicial activism. Senate Democrats threaten a filibuster to prevent a confirmation vote and ending the filibuster requires 60 votes. With 52 Republican senators, that will require the support of eight Democrats, and will be difficult to achieve. Following the lead of former Nevada Democrat Harry Reid when he was Majority Leader, Republicans can use the “nuclear option” to allow a simple majority vote to confirm Gorsuch. Majority Leader McConnell has pledged that one way or another, Gorsuch will be confirmed.